24,000 small and medium-sized businesses eclipsed $1 million in sales in Amazon’s marketplaces worldwide in 2018; the number grew by 20% from 20,000 in 2017. Millions of sellers from around the world are selling on Amazon, but less than one percent have been able to achieve $1 million in sales. 50,000 sellers exceeded $500,000 in sales, and 200,000 sellers sold more than $100,000. These three figures were reported by Amazon. “This year growth of small and medium-sized businesses in our stores enabled business owners to create new products, provide greater selection to customers, and reinvest in their local communities through job creation,” said Nick Denissen, Vice President for Amazon. Our research matches Amazon’s official figures - according to our data there are estimated 206,237 sellers with $100,000 in sales, 50,465 sellers with $500,000 in sales, and 23,172 with $1 million in sales. Estimates further extend to 889 sellers with $10 million in sales, 20 sellers with $100 million in sales, and a few with more than $500 million in sales. With every 10x increase in sales volume there are exponentially less sellers who have achieved it. That’s because marketplaces tend to exhibit power law distribution, the observation that a large portion of sales on a marketplace is generated by a small fraction of its sellers population. These top sellers on Amazon are responsible for the majority of the overall volume on the marketplace. The growing number of sellers achieving these sales milestones is a direct result of the overall marketplace growth. Every year it gets larger, providing opportunities for both new sellers to enter the market, but also for existing sellers to expand. However, maybe unsurprisingly, the bigger the sales figure is the slower that segment is growing. Third-party sales are growing at a faster rate than first-party sales on Amazon and other retailers in the U.S. Over the years this has compounded to make the marketplace the largest online retailer in the US, with the total sales volume by all marketplace sellers estimated at $175 billion. Close to half of the sellers with $100,000 in sales sell on the US marketplace. 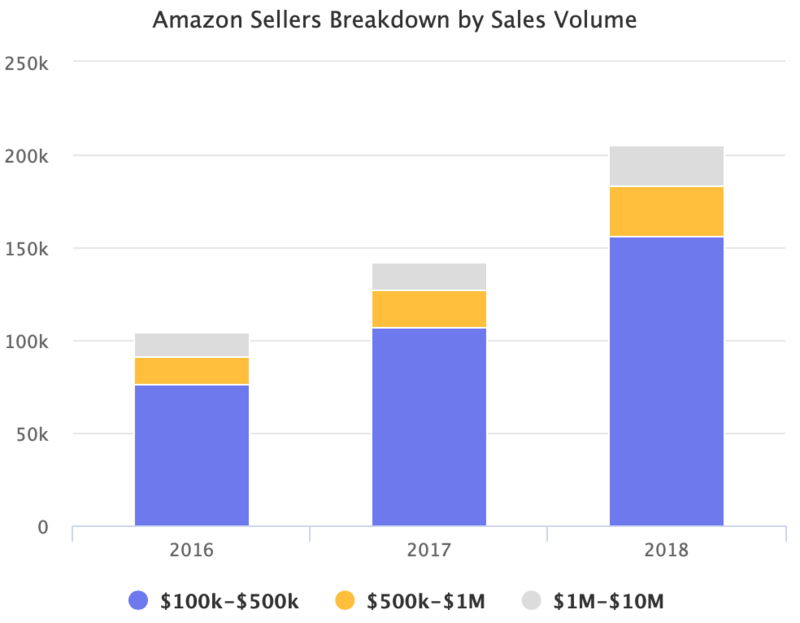 While more than a million new sellers joined Amazon last year, the number of sellers to have reached $1 million in sales increased by mere 4,000. This is the Amazon marketplace funnel. Millions of sellers at the top, only tens of thousands at the bottom. There are millions of sellers with products listed for sale - more than 2.5 million sellers currently active selling on the marketplace - but only a few tens of thousands have built a business.